My kids are still working their way through the Nat Geo Kids Weird But True! books we got last month. We love Nat Geo kids books so much, there was no way I could say no to adding 8 more books in time for the holidays. National Geographic Kids books make wonderful gifts for kids, and we appreciate our sponsor for sending us another amazing collection. We have all winter to dig our way out of this book pile, and we will have a great time doing it, too. I was curious to see which books my kids would be drawn to first. There is such a variety of subjects in this collection. Birds, space, fiction adventures, jokes, dogs, weird facts, and you get the idea. To the Moon and Back: My Apollo 11 Adventure A Pop-Up Book has become a quick favorite for one of my boys. My 9- and 11-year-olds enjoy reading non-fiction fun fact books, Ultimate Secrets Revealed: A Closer Look at the Weirdest, Wildest Facts on Earth and National Geographic Kids Why Not? : Over 1,111 Answers to Everything. Read on for a little blurb about each one of these book treasures. I know you’ll find the perfect book gift for your child this holiday season. 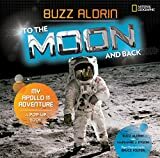 To the Moon and Back: My Apollo 11 Adventure A Pop-Up Book by Buzz Aldrin with Marianne J. Dyson (ages 8-12, hardcover, $32.00) isn’t your ordinary pop-up book. It’s got pop outs, slide outs, amazing photography, tons of interesting facts, and never-before-published stories from Buzz Aldrin. Celebrate the Apollo 11 Mission’s 50th Anniversary with this incredible book. A build-your-own Apollo 11 lunar module is also included. Did you know that 2018 is Nat Geo’s Year of the Bird? 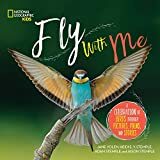 Fly With Me: A Celebration of Birds Through Pictures, Poems and Stories (ages 4-8, $24.99) book was released during the 2018 initiative to bring awareness to the plight of birds around the world. From history and behavior to spotting and photographing, there’s something for every bird fan in the flock. Young birders will learn all about migration and the importance of habitat conservation. They’ll find stories about bird rescues and fun facts about the fastest, strongest, and tiniest fliers. They’ll also discover the best bird nests, sweet songs to sing, ways to listen for and identify the birds around them, and more. NEW FICTION SERIES! Explorer Academy: The Nebula Secret by Trudi Trueit ($16.99, hardcover, ages 8-12) Adventure, danger, and a thrilling global mission await 12-year-old Cruz Coronado as he joins an elite school for explorers. Cruz leaves his tranquil home in Hawaii to join 23 talented kids from around the globe to train at the Explorer Academy with the world’s leading scientists to become the next generation of great explorers. But for Cruz, there’s more at stake. No sooner has he arrived at the Academy than he discovers that his family has a mysterious past with the organization that could jeopardize his future. In the midst of codebreaking and cool classes, new friends and augmented reality expeditions, Cruz must tackle the biggest question of all: Who is out to get him, and why? Readers can get in on the excitement with puzzles and codes embedded throughout and book two in this seven book series, The Falcon’s Feather, comes out this March! GREAT STOCKING STUFFER! Just Joking Jumbo 2 (ages 7-10, paperback, $14.99) – – Kids will laugh their tail off with a jumbo-size, jam-packed joke book featuring 1,000 jokes and 1,000 photos. With silly facts that are strangely true, laughable lists, conversation jokes, and long-story jokes with hilarious endings, this full-color, supersize book include funny stuff about pets, technology, spooky sensations, adventures, around-the-world wonders, animals, myths and legends, dinosaurs, music, and treasure hunting. It’s the perfect combination of laughing, learning, and maybe jump-starting a career in comedy! Dog Science Unleashed: Fun Activities to Do With Your Canine Companion (ages 8-12, paperback, $12.99) Dog Science Unleashed shows kids how they can learn about science with the most faithful lab partner they’ll ever have, their dog! Twenty-two safe and pup-friendly activities let young scientists discover how their canine companions think, move, drink, stay warm, get clean and cool off. From determining your dog’s favorite smell, to figuring out if your dog is a righty or a lefty, to making a stethoscope to listen to your hound’s heart, Dog Science Unleashed explores the science behind dogs’ senses, how they move, how they learn and much more. Each activity is paired with step-by-step instructions, clear and interesting scientific explanations, and photographs that illustrate important elements of the experiments and observations. Hands-on activities and fun information for budding scientists prompt further learning and offer a look at current, groundbreaking canine research. One lucky winner will receive the National Geographic Kids Holiday Prize Pack, which consists of all EIGHT title listed above (ARV $152). Open to USA entrants ages 18+ only. Please use the Rafflecopter entry form below for your daily chances to enter to win. Giveaway ends December 18, 2018.